Artist's impression of the regenerated Union Terrace Gardens. The project has been hailed by the city council as a means of driving Aberdeen’s transformation and the importance of having it come to fruition as swiftly as possible has often been stressed. Construction has yet to start, however, and without a spade yet hitting the ground it is feared it may be impossible for the project to be completed within the estimated 18-24 month timeframe, even if it stated tomorrow. SNP group leader Stephen Flynn said meeting the timescales would “simply not happen” and that even the provisional summer 2020 completion date looks unlikely. He said city residents would have to endure a lengthy wait for the promised improvements and said it was indicative of a council steeped in major project failure. Numerous council projects have been severely in recent years, including the Broad Street revamp, the Diamond bridge, art gallery, Provost Skene’s House and the central library. Aberdeen Council’s co-leader Douglas Lumsden said he was disappointed to see the SNP undermining a project that has been “shaped by the public” and stressed the council’s commitment to the city’s regeneration. 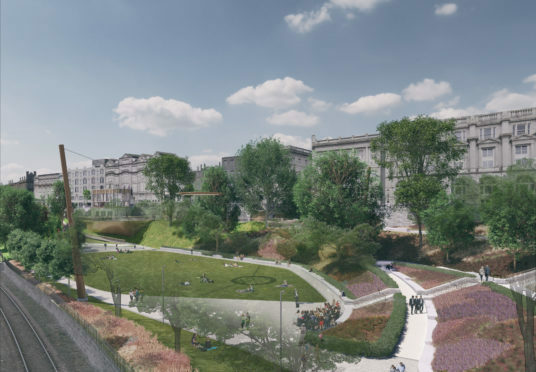 Mr Flynn, however, said: “The report which came before councillors just before the election indicated that the construction of Union Terrace Gardens would be finished less than a year from now. “Quite simply, that will not happen. Councillor Lumsden stressed the public’s support for the transformation, which is part of an ambitious city centre masterplan. He said: “The £22 million upgrade of Union Terrace Gardens is something that the public of Aberdeen welcome. “The project is currently out for tender and the bids received will be considered, as is the case for any capital project. “This project has captured the imagination of the public and the upgrade will allow the gardens to be accessible by all. “This administration is committed to upgrading UTG as part of its regeneration plans for Aberdeen. LDA Design won planning permission for their Union Terrace Gardens plan in March, having been first attached to the project in September 2016. That permission was awarded by councillors after years of indecision as schemes by other celebrated architectural firms – and a plan put forward Sir Ian Wood – have failed to go ahead.